Traditional style litter bin manufactured from heavy duty recyled material. Supplied with a Lin..
Doggybin Litter Bin. Designed to make the disposing of dog waste as hyienic and as simple as po..
Falcon Litter Bin. This litter bin features a modern style and decorative band. Capacity 90 L..
Merlin Litter Bin. This stylish modern design features a unique bayonet locking mechanism which..
Nickleby Litter Bin. Large capacity post/wall mounted litter bin with lockable lid in tradition..
Osprey Litter Bin. 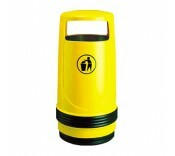 Large capacity litter bin with lockable lid. Also available in an open top..
Phoenix Litter Bin. Traditional style litter bin. Manufactured from zinc- coated galvanised s..
Pickwick Litter Bin. Victorian design in an inexpensive, easy to empty bin. Manufactured from..
Byron Litter Bin​​ The Byron is an unobtrusive, attractive bin that can be placed either inside..
Shelley Litter Bin The Shelley provides waste disposal either indoor or out. Manufactured fro.. The Oil Drum Converter transforms the typical 45 Gallon drum into a waste bin. Ideal for activi.. Allows selected litter bins to be fixed to ground​ Fixing plate available for Merlin ..